The Union of the Republic of Myanmar has opportunities to be developed in leaps and bounds by the effective management of geographical dispersion and varying socio-economic conditions, via the use of e-Government system. In an attempt to achieve rounded development covering administration, social, economic, education and health sectors by Myanmar government, e-Government can be considered as an important component. With this in mind, the government, aiming at the economic development, has included the policy “to establish Data ID Card System, Digital Government Strategy and e-Government system” in the economic policy as a national objective in August, 2016, for the successful implementation of e-Government process. The e-Government system enables the government agencies/ organizations to provide effective services through ICT technology as a useful tool. Moreover, the government implementing e-Government process are considered to be a smart government, a government caring sustainability, a government caring the future generations and so on. Indeed, those who actively use the public services of a government are its citizens. What is more, in many countries these days, citizens can participate in the decision making process, which highlight the trend of governments moving towards people-centered approaches. On account of innovations and development in e-Government process, the utilization and demand for ICT related hardware and software in public and state-owned sectors can be on the increase. This, in turn, can be able to increase supply of and demand for ICT business in the country. Then, with the help of laws, bylaws and regulations, ICT business and ICT sector as a whole can be an important economic infrastructure of the country. 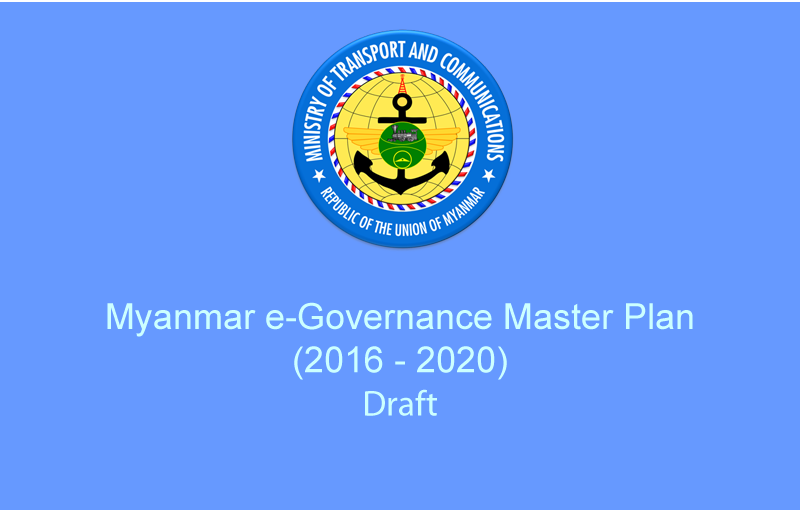 Therefore, in order for e-Government system to be successfully implemented under comprehensive strategies and policies, framework and structures, Ministry of communication and information technology (previous) has started the preparation of Myanmar e-Governance Master Plan in 2014, with financial and technological assistance of ADB and Infosys Limited, India, along with the cooperation of government agencies, ministries, businesses, research teams, agencies, local and international ICT/ e-Government specialists plus analytical study on related international experiences.